Harrogate is well supplied with large hotels, many dating to the town’s boom in the late-19th century – or even before, the spa being well established by the early-18th. One witness to the town’s earlier life as a watering places was the traveller redoubtable Celia Fiennes, who visited in 1697 and recorded that she could not force her horse to come near the ’Sulpher or Stincking Spaw, not improperly term’d’. * She tried a couple of quarts of the noxious water and found these doses to be ‘a good sort of Purge if you can hold your breath so as to drink them down’. The hotels are variously classical, Italianate, or a sort of free style with many bays, prominent gables, and mansard roofs. My photograph shows the Crown, which is in a mixture of styles, and has a long history. Before the current building was put up, there had been a hotel here for a long time, even before the Crown was owned by the Thackwray family form 1740. Lord Byron, who stayed in 1806, was one of the best known guests, and he recorded that his beloved dog Nelson§ had to be put down after attacking a horse in the hotel’s stable yard. The Crown was very convenient for the town’s sulphur well, which only a few yards away and available to all. Joseph Thackwray, however, sunk his own private well in a building adjoining the Crown, greatly reducing the flow from the public well. There was an outcry from other innkeepers, and when a group took legal measures against him, he relented. 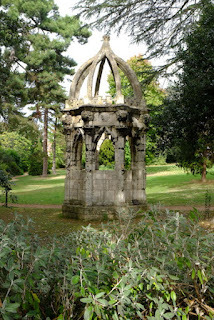 It is said that this case actually alerted the town to the value both of its wells and of its pleasant environment generally, and so preserved the generous public green spaces that distinguish the place to this day. In 1847 the Crown was rebuilt in the classical style, and this building remains the core of what’s there now – the 3-bay central section (pilastered, with rectangular windows), flanked by slender 1-bay side wings. This was extended in the Italianate style (bay windows, with round-topped central openings) in 1870, when the two parts were unified by building the balustered parapet across the top of the whole front. almost concealing the low hipped roof behind. There were yet further elaborations, including extensions to the sides in around 1899, including the tower visible on the right. The result is an impressive ensemble, near the centre of the town and not far from the greenery of The Stray. In short, an excellent venue for the festival† I attended two weeks ago and no doubt a fine centre for visitors who’ve been coming for hundreds of years. § A mastiff, apparently, not the poet’s most famous dog, the Newfoundland Boatswain. Last week I spent an enjoyable couple of days in Harrogate, speaking at the excellent Raworth’s Harrogate Literature Festival and spending a lot of time just standing and staring at the architecture. 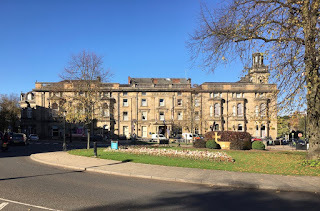 As someone who grew up Cheltenham and has a particular affection for Bath, both spa towns, I’ve always liked the spa town of Harrogate too – though I’ve not been there for years. I was struck by the stone: Harrogate is a stone town, like Bath (and unlike Cheltenham, where the buildings are predominantly stucco). But whereas Bath’s local stone is creamy limestone, the builders of Harrogate used mainly sandstone from the surrounding area, the various millstone grits with picturesque names (Follifoot Grit, Addlethorpe Grit, Upper and Lower Plompton Grit, and Libishaw Sandstone) that give the place its characteristic look. These stones vary in colour from grey to brown, and many look darker than the southern limestones typical of places like Bath. They’re also often finished less smoothly – sometimes rock-faced, sometimes with a flat face but with the chisel’s tool marks left very much visible. The other thing that marks Harrogate out from those other two great spas is its date. In contrast to Georgian Bath and Regency Cheltenham, Harrogate came into fashion in the second half of the 19th century, so much of its architecture is Victorian. This building, for example, is of dark stone in a mix of masonry finishes – mainly rock-faced stone for the walls, with smooth ashlar around the windows and doors. 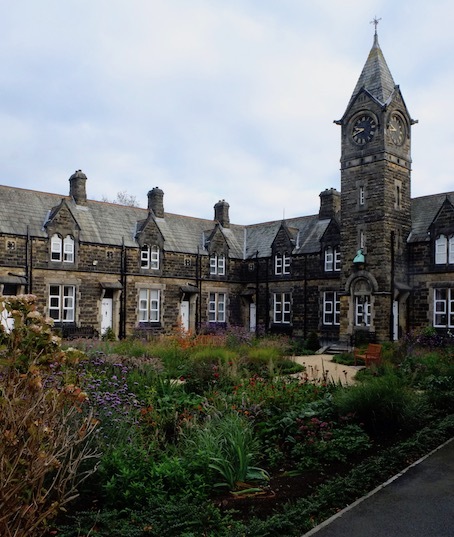 The trefoiled upper windows and the clock tower with its short spire take their cue from the Gothic style, as is not unusual for for almshouses of the Victorian period. They were built in 1868 by textile manufacture George Rogers, whose business was in Bradford but who had a close connection to Harrogate and intended as houses for elderly people from either place. 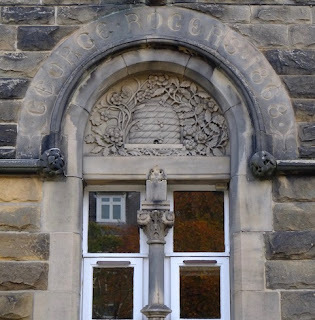 Rogers's emblem of hard work, the bee and its hive, is placed above the central doorway. Bees must be in evidence, too, in the courtyard’s lovely garden, which was still showing a little colour in the late-October warmth. That garden, together with the architectural flourish of the spire, suggest that a decent environment was (and is) being valued here, not just a necessary minimum. Victorian values weren’t all bad. 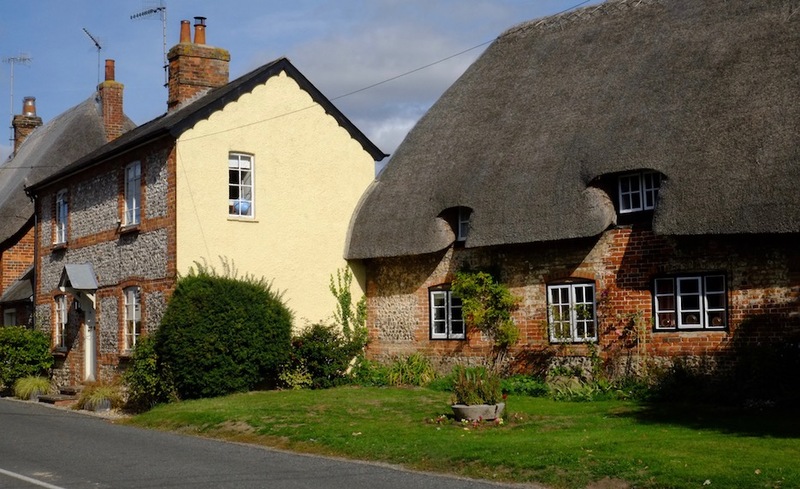 In a lot of southern England the rock that underlies the fields, villages, and towns is chalk: there’s a lot of chalk underfoot in Dorset, Wiltshire, Hampshire, Sussex, Kent, and Surrey. 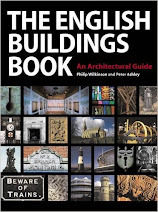 You can build with chalk, but it’s a soft rock and not an ideal building material, but along with the chalk goes flint, which is found in the upper layers of the chalk and is used in many places for building. Flint, on the face of it, isn’t an ideal building material either. It occurs in rounded nodules, and to build a wall out of these small lumps of flint, you usually need a lot of mortar. When napped or split into workable pieces with a flat side to form the face of the wall it often looks black or grey, and this can be overwhelming in large stretches. So for visual reasons and for structural ones (lots of mortar can make a weak wall) the builders of the chalk areas have devised lots of ways of combining flint with other materials – bands or strips or blocks of other more workable stone, or courses of bricks. This kind of combination of flint and brick, which I was looking at in Wiltshire and Hampshire the other week, can be particularly attractive. These houses are in Hurstbourne Tarrant, where there are several such buildings. Brick is often used at the corners, and around windows and doors, as can be seen clearly in the left-hand house. In the thatched house to the right, the combination is more of a mash-up, probably because the building has been altered or rebuilt at some point (or at several points). One often sees houses that combine these flint and brick walls with walls of other materials – a side wall that’s all brick, for example, or, nearly as often, a front wall of brick and a side wall of both flint and brick. The resulting patterns are usually pleasing from whichever angle you view the building, with ingenuity and visual flair working well together: in places with this kind of architecture there’s never a visually dull moment. I’d never looked properly at Stockbridge before, and when I finally stopped for a walk round I was struck by it in several ways. ‘A walk round’ is not quite the right phrase in Stockbridge, because the place is basically a single long street, which you walk up and down. It gives them impression, with its generous width, its imposing Town Hall, and its landmark hotel, that’s it’s the High Street and market place of somewhere much larger. As you walk along you go over bridges – you’re never far away from moving water because the place stands on various branches of the River Test, fast-flowing, trout-rich, and beloved of fishermen for centuries. So this street is very much what Stockbridge is about, and not just because it’s so impressive but also because it must once have been an important travel route. Coaches travelling west out of London would mostly have travelled on roads that lie further north – through Andover, say, or Newbury – to head for Bristol, Bath, and the far West. 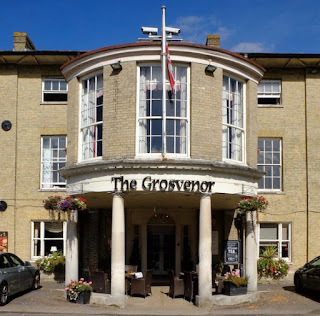 But someone in the 18th or 19th centuries wanting to go to Salisbury, or on down to Weymouth, beloved of George III and those who travelled in his wake, might well have travelled through Stockbridge. No doubt the porch also did its work sheltering passers-by from the rain and wind. Now its job seems to be to house tables and chairs for afternoon tea. Not the only place, as I discovered, where it’s possible to sit, enjoy refreshments, and watch the passing pedestrians and traffic, which the day I was there included no carriages, but what was to me a pleasing selection of classic cars. The High Street still seems to be a well used road, if more for local and leisure traffic than for those travelling long distance, who nowadays sacrifice urban scenery for speed, and make for the faster-moving A303. *Or if you couldn’t quite drive underneath it, you could at least pull in at the front, and your passengers would be undercover in an instant. 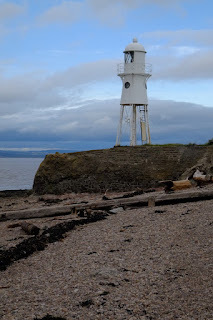 The small, sturdy metal structure of Black Nore Lighthouse was put up in 1894, to assist shipping in the Severn Estuary. It flashed every ten seconds to guide countless vessels towards and away from the harbour at Bristol, until it was taken out of service in 2010. It originally had a clockwork drive mechanism and this was only replaced with electric motors in the year 2000. Although this light is no longer needed, there’s another not far away at Battery Point, which still guides ships. Fortunately, the lighthouse has been preserved (it now belongs to a trust that looks after it), so I could find it the other day when I was in Portishead to give a talk and arrived – as is my wont – much too early. I’m a great advocate of arriving early for meetings and talks, as it usually gives me the opportunity to have a look round somewhere and, as often as not, find some interesting bit of architecture or structure. 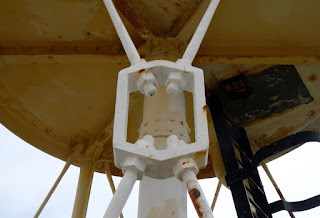 I especially like the metal cross rods, attached with screw threads and nuts to the bit of metalwork in the centre, shown in my lower photograph. So I was pleased to have a little time here, to find this relic – even if the sun was obscured by clouds and the scene looked a little more gloomy than I’d have hoped for. Light is as vital for photography as for navigation. Churchyards are often interesting places and you never know quite what you might find in them. 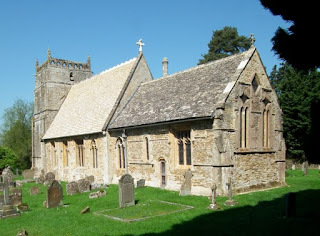 Having admired a number of memorials in the churchyard at Hurstbourne Tarrant, including some near the church that dated to the early 19th century, I walked towards the northern edge of the graveyard, through trees, and up a considerable slope. I wasn’t quite sure where I was going as I picked my way through windfall apples. What I found was a further section of churchyard, screened from the church by the trees, and at its far edge this mausoleum, with classical pilasters and a pyramidal roof, itself almost hidden by vegetation. At first I thought I’d found a bit more funerary architecture of the Regency period, a squire’s tomb of c. 1820, perhaps, with a nod to the Egyptian taste on a firm classical base with a couple of bands of rusticated masonry. But there was something not quite right about it. 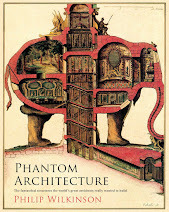 Weren’t those wrought-iron gates with their curvaceous metalwork rather Art Nouveau in appearance? And inside I made out a plaque recording a death in 1935. Yes: didn’t the details look a bit like 1930s Georgian revival in places? At some point in the early 1930s, Henry Wykey Prosser was told by a London specialist that he had less than five years to live. He immediately began putting his affairs in order, a process that involved drawing up a will providing a fund of £2000 so that elderly residents of Hurstbourne Tarrant could have Christmas provisions and leaving the then considerable sum of £100,000 to his housekeeper (provided that she remained unmarried and continued to live in his house). 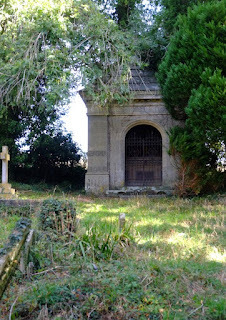 His last years were also spent supervising the construction of this mausoleum. The newspaper records that although Prosser spent a lot of money improving his house and estate, he was not well liked in the village, because he was constantly arguing with local people, particularly about rights of way, drove a hard bargain, and went to law if he did not get his way. He was also obsessed with security, overseeing a nightly ritual of door locking and shuttering before taking his loaded revolver to bed with him. *Note to self: I must invest in the updated edition. †Yes, a Jamaica newspaper. Postscript: One of my readers wonders whether Kingston, Jamaica, was named after the Duke of Kingston, of Thoresby Hall: She notes: ‘He was still an Earl in 1703. He was a (very?) rich man, and a Tillemans painting of him of c. 1726 shows him with a black servant… Very possibly, he was a plantation owner/slave trader. He laid out a vast landscape at Thoresby on the 1700s.’ If anyone knows more about him, this reader would love to know more, so did please reply via the Comments section of this blog. A couple of other unexpected things in churchyards: a bee shelter and a beautiful sculpted seat. Just a few yards from the building in my previous post is another structure that has been relocated from its original site. This ornate octagonal pavilion is Scriven’s Conduit, built in 1636 in Southgate Street in the centre of Gloucester as part of the city’s water supply. It displays a wonderful mix of architectural styles, Gothic rubbing shoulders with Classicism in a way not unusual in the 17th century. The top was rebuilt in 1705 and originally bore a finial featuring Jupiter Pluvius (Jupiter in his role as rain-bringer) pouring water on to Sabrina (the goddess of the Severn). Although this has now gone, there are still some magnificent lion masks and some very worn roundels depicting notable trades found in Gloucester. Like the King’s Board, it was taken down when no longer needed in the city centre and moved. It went to Edgeworth Manor before returning to Gloucester, this time to the site in Hillfield Gardens where it remains to this day. Gloucester, an ancient city that has lost much through redevelopment, actually preserves quite a lot of historic architecture – several medieval churches, some friary buildings, its great dock warehouses, not to mention its magnificent cathedral. Search a little further, and, as I hope this and my previous post have helped to show, it’s amazing what riches the city discloses.